Question: What are the features of the Next Generation of Photosensitizers and (PDT) Photodynamic Therapy? Question: What is the mechanism that "kills" the cancer? Question: How quickly does it work? Question: How is it possible that light can penetrate deeply into the body? Question: What is singlet oxygen? Question: How does it lead to tumor death or destruction? Question: How long does it last/how much of an area does it affect? Question: How does the next generation of PDT differs from "traditional" PDT? Question: How effective is it? Question: Can NG PDT help metastatic disease? Question: HOW CAN DEEP TUMORS BE TREATED? Question: What is the evidence that it works? Question: How long does the benefit last from the therapy? Question: How does this therapy compare with traditional therapies i.e. : surgery / chemo / radiation? Question: Can Next Generation PDT be combined with surgery /chemo/ radiation? Question: Does it matter if a patient has had prior chemo therapy? Question: Can it be repeated / Does resistance build up? Question: What is a "Photosensitizer"? Question: What makes an "ideal" Photosensitizer? Question: What are the limitations of "first Generation" agents? Question: Who produces the photosensitizers? Question: Are photosensitizers toxic or harmful? Question: How are photosensitizers given? Question: What type of light is used? Question: How are blue, red and infra-red wave lengths use to treat different types of problems? Question: What is the ideal light source? Question: What is the difference between a laser and a led? Question: What are the advantages of each? Question: Can Photodynamic Therapy be used to treat liver metastases? Question: Will my physician/oncologist know about older forms of PDT and the huge advances arriving with advanced PDT technology? Question: What is a "typical" course of therapy? Question: Are there any factors that reduce the effectiveness of NG PDT? Question: What other therapies may be used in conjunction with the NG PDT therapy? Question: What happens after the therapy? Question: Does it need to be repeated? Question: Where is NG PDT available? Question: Does insurance cover the cost? Question: Why isn’t this therapy more available? Question: How long has this therapy been around? Question: Why have I not heard about this before? Question: My Doctor is skeptical about the therapy. How do I get him to examine the facts and evidence? Question: Possible future benefits from Next Generation PDT/PDT? Question: What types of diseases/cancer benefit from the therapy? Question: Do any Eye diseases benefit from therapy? Question: Why do photosensitizers also selectively accumulate on cholesterol plaques, new vessels, viruses, bacteria, fungus? Answer: NG PDT is an advanced form of photodynamic therapy (PDT); a treatment which uses light to destroy cancer tissue. In both Next Generation PDT and PDT patients are given a photosensitizing agent. Traditionally, PDT has been confined to treatment of superficial lesions or localized problems that can be either directly visualized or reached with devices called endoscopes that are inserted into body openings. This Next Generation PDT on the other hand is aimed at treating whole regions and tumors deep in the body. Answer: Next Generation Photodynamic therapy is a minimally invasive treatment method developed for use in a wide range of diseases characterized by hyperproliferating (actively and rapidly dividing cells. Using a photosensitizing drug and laser or LED light, PDT can selectively destroy targeted tissues. Treatment of disease with Photodynamic Therapy is a two-stage process. The first stage is the intravenous or oral injection of the photosensitizer and after a number of days, or hours, the tumor to be treated is exposed to non-thermal light of the specific wavelength needed to activate the drug. The delay between injection of the sensitizer and its activation is designed to allow the drug to accumulate selectively in the tumor tissue. The second stage is the delivery of light to the tumor by a light source or fiberoptic bundle. A fiberoptic cable carries light from the light source device to the point where the light is to be applied. The photosensitizing drug retained in the tumor cells is activated by the light and the energy absorbed by the drug is then transferred by a natural conversion to oxygen within the tissues. This produces a highly reactive form of the oxygen, termed singlet oxygen, which causes lethal destruction within the cancer cell. Answer: The damage to cancer cells results from a multi-step process. First the photosensitizer is administered which leads to the selective accumulation on the target cancer cells. Following a period of time specific for each agent to allow the photosensitizer to clear from normal tissue, light is applied. Because the agent molecules are light sensitive, they are energized and become unstable and electrons are donated to oxygen in the immediate vicinity creating a special type of reactive oxygen species called ‘singlet’ oxygen. These molecules too are unstable and also off-load energy to the adjacent cellular structures of the cancer cells which damages and in many cases ‘kills’ the cancer. Answer: This process of damage to cancer cell begins immediately and in many cases the effects of the therapy are apparent at the end of the therapy session.. Some of the cells may be killed and fragmented immediately. Likewise, other cancer cells can be injured but not sufficiently to cause immediate death. They may be affected enough to simply not be able to reproduce. The body can recognize this damage and ‘program’ the cell to be progressively eliminated and removed; a process known as apoptosis. In many cases this is a milder and gentler method of elimination of the cancer cells since this process results in less inflammation and reaction. Another rather prompt result of the treatment is coagulation and stasis of blood flow in the vessels that supply the tumor. It is sometimes asserted that light cannot penetrate the human body more than a few millimeters or at most a few centimeters. Therefore, skeptics say, it is impossible to perform photodynamic therapy (PDT) for deep-seated tumors. Yet this statement contradicts common-sense experience. If you put an ordinary light, such as a laser pointer, up to your fingers, you can see the red light penetrate right through the bone and out the other side. Even with a light source as weak as a flashlight, if you shine it on your palm in a darkened room, some red light will emerge through the other side. The ability of light to penetrate tissues to depths much greater than a few millimeters has been confirmed scientifically. Dr. Harry T. Whelan of the Medical College of Wisconsin and NASA's Marshall Space Flight Center in Huntsville, Alabama, is an expert on the use of light-emitting diodes in medicine. He writes:” Spectra taken from the wrist flexor muscles in the human forearm and muscles in the calf of the leg demonstrate that most of the light photons at wavelengths between 630 and 800 nanometers (nm) travel 23 centimeters (cm) through the surface tissue and muscle between input and exit at the photon detector." Twenty-three centimeters is 9+ inches. Logically, therefore, if you illuminate the whole body, front and back, with light in the range of 700nm to 1300nm almost any part of the human body can be treated. This is roughly the range of wavelengths the most advanced agent are being developed for optimum treatment. 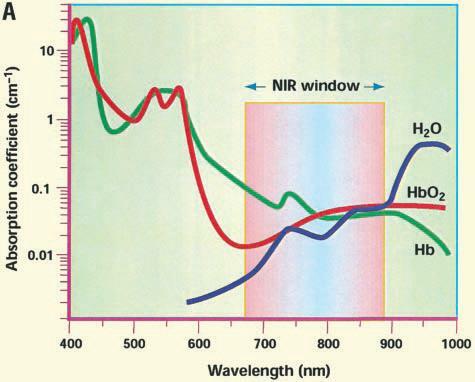 Because light in the near-infrared (NIR) region (700-1300 nm) has decreased absorption by either blood or water compared with visible light (400–650 nm) tissue penetration of NIR photons may be up to 10–15 cm and still maintain half its initial energy level. Importantly, with NG PDT laser technology utilizing a pulsed mode function tissue penetration of Near Infra Red photons (wave length 1200+nm) up to 10 to 20cm so deep tumor may be treated successfully. Light is visible to the human eye as the colors of the rainbow, which have wavelengths ranging from 400 to 700 nm. Red light has the longest wavelength, ranging from 622 to 700 nm. Light at wavelengths greater than 700 nm is characterized as infrared and is invisible to the human eye. Most experimental and commercial photosensitizers absorb light in the range of 630 to 820 nm. For instance, Photofrin (which is approved by the Food and Drug Administration to treat several forms of cancer) has a ‘small peak of absorption at 630 nm. ALA (Levulan) also absorbs at 630 nm. The experimental chlorin derivative Foscan absorbs at 652 nm. Visudyne, which is FDA approved for the treatment of macular degeneration, absorbs at 690 nm. Another chlorin derivative, SQN-400, absorbs in the infrared range at 740 nm. And certain bacteriopurpurins absorb light as high as 800 to 820 nm. Answer: When photosensitizers (light sensitize molecules which selectively accumulate on cancer cells) are illuminated with certain colors of light they absorb the energy and become ‘excited’. With this extra energy, they become unstable and ‘off-load’ or donate energy as electrons to oxygen in the immediate vicinity and create a special form of oxygen named ‘singlet’ oxygen. These singlet oxygen molecules also are highly unstable and ‘off-load’ energy by donating electrons, oxidising (damaging) the nearby structures in the cancer cells. Answer: When the structures in the cancer cell are oxidized, the resulting damage to the internal microstructures (mitochondria, lyposomes, nucleus or cell membrane etc.) leads to death or damage of the abnormal cells. Because advanced photosensitizers are highly selective the damage to the cancer cells is highly specific. Answer: Photosensitizers selectively accumulate on diseases cells and following the application of light, singlet oxygen is generated. Singlet oxygen has a short life-span (milliseconds) and a very small area of effect (microns) so the damage from the oxidation of microstructures is confined very selectively to the cancer cell. The greater the selectivity of the photosensitizer, the better the localization of the damage from singlet oxygen formation to the cancer. Answer: Although the next generation of PDT and PDT are both based on the principle of using light to kill pre-sensitized cancer cells, the next generation of PDT differs from PDT in several important ways. First, the sensitizing agent used in the next generation of PDT is in many cases more cancer-selective than the first Generation agents typically used in PDT. The agents licensed by the FDA for use in PDT are for the most part hematoporphyrins, derived from pig and ox blood. These blood-derived photosensitizers accumulate in all the tissues of the body, not just in the cancer tissue and are very slow to be metabolized and excreted. Patients who are given these agents must therefore be careful to avoid light for periods of weeks at a time or risk serious burns to the skin. By contrast, some advanced agents such as Photosoft are 95% metabolized and cleared from the body within 24 hours, freeing patients from the need to hide from the sun for weeks after treatment. Second, because the blood-derived photosensitizers are less powerful (they have a much lower yield of singlet oxygen, the molecules that help to damage or destroy tumor cells) they are not useful for the treatment of deeper seated problems. Instead, fiber-optic catheters or endoscopes must be inserted into the body to bring the light directly to the seat of the tumor, and this limits the scope of the technique considerably. If a tumor cannot be physically reached either by endoscopy or with interstitial insertion of needles and fiberoptic bundles into the tumor it essentially cannot be treated. Also widespread metastatic cancer cannot be treated with these less than optimal photosensitizers developed many decades ago. By contrast, because advanced agents are much more sensitive to longer wavelength light and more powerful than existing ‘approved’ photosensitizers they can be activated at higher wavelengths, which allows a greater depth of penetration and a higher yield of singlet oxygen. In the next generation of Photosensitizers activation takes place from outside the body, minimizing the need for intrusive procedures such as endoscopy or laparoscopy. Next Generation PDT is a much less intrusive technique than PDT and there are fewer side effects because of the lack of specificity of Photofrin (it accumulates in all tissues, not just in cancer tissues) and its relative lack of sensitivity (it has to be activated by direct application of light, necessitating the use of endoscopes or fiber-optic catheters), the number and type of cancers that are suitable candidates for treatment with classical PDT are relatively few. Metastatic, deep-seated and larger tumors are not treatable with PDT agents that are not rapidly cleared from the body and do not have higher wave length activations. In addition, Photofrin one of the first generation agents with FDA approval has other drawbacks such as protracted and generalized light sensitivity: it takes several weeks to clear from the human body and during this time patients remain exquisitely light-sensitive, risking serious burns if their skin is exposed to sunlight to even artificial light. Next Generation PDT represents a major advance over classical PDT. The photosensitizers used are clearly superior to Photofrin and the other first Generation sensitizers that have so far been developed. New photosensitizers are much more cancer-specific, accumulating preferentially in cancer tissue, and are quickly cleared from the body. Using advanced protocols with oral administration of the agent, patients can typically go about their business and need not remain captive in their homes or a hospital environment, fearing serious skin reactions. Many PDT patients benefitting form the next generation of PS also do not need invasive endoscopic treatment procedures. Because these photosensitizers are so much more light-reactive and efficient they can be activated from outside the body, reducing or eliminating the need for direct illumination via fiber-optic catheters and endoscopes. A decade ago, Dr Jacob Lieberman wrote: "I can foresee that, in the near future, photodynamic therapy, alone or in combination with other conventional techniques, will be able to successfully treat most, if not all, cancers and other life-threatening diseases. Many authors have written enthusiastically about the potential of PDT and maintained the hope that some day there would be a form of light therapy that would fulfill the enormous promise of the early work in this field. The scientific community now seems to have achieved that breakthrough in the form of Next Generation PDT. With improving protocols and effectiveness of agent we feel patients even with advances stages of cancer may, in many cases, benefit from the therapy. On the website: www.nextgenerationpdt.com a number of clinical studies are collected from well recognized Universities which document the degree of effectiveness in this concept for many types of cancers. These clinical studies are found on the pubmed area of the New England Journal of Medicine website www.nejm.org . Answer: NG PDT is effective in treating metastatic cancer because even metastatic, microscopic cancer cells that are too small to be seen with traditional diagnostic imaging techniques ( PET, CT scan, X-ray) are killed with the whole body treatment with NG PDT. Killing these cancer cells with PDT has been shown in numerous scientific studies for many patients to develop tumor specific antibodies for a systemic anti cancer vaccine type effect. Answer: NG PDT chlorophyll derived molecules circulate via the blood stream and attach and concentrate in abnormal and cancer cells throughout the body. These special molecules are activated by certain types of light and forms of oxygen are produced in the cancer cells which selectively damage and kill them. Even with metastatic cancer where cells are spread throughout the body NG PDT is effective. Answer: Because light in the near-infrared (NIR) region (700-1300 nm) has decreased absorption by either blood or water compared with visible light (400–650 nm) tissue penetration of NIR photons may be up to 10–15 cm and still maintain half its initial energy level. NG PDT uses a combination of highly light sensitive molecules which attach to tumor throughout the body with deeply penetrating laser and LED light to effectively treat deep tumors. Answer: The observation that certain light sensitive molecules ‘cling’ to abnormal cell and with light lead to selective death of tumor cells has been proven beyond any doubt. This was observed nearly one hundred years ago and culminated with the approval by the FDA of Photofrin for use in various types of lung and esophageal cancer in the mid 1990’s. Since that time photosensitizing agents have been approved by various Medicines Authorities around the world for use in skin cancers (Metvix), head and neck cancer (Foscan), eye conditions (Visudyne), multiple cancer indications (Alasens, Photogen, Photosens) and others. Over 35,000 scientific journal articles appear in search of Medline on the internet and the New England Journal of Medicine, one of the US’s most prestigious and respected medical journals has a vetted list of over 7500 articles on ‘PDT and Cancer’. At this time dozens of clinical studies are appearing every month in professions publications around the world. Nearly a thousand clinical studies on PDT are found on the pubmed area of the New England Journal of Medicine website www.nejm.org . Answer: While the benefits of cancer destruction or damage (apoptosis), stasis, coagulation of vessels feeding the tumor and the potential production of tumor specific antibodies (auto vaccination) begin soon or immediately after the initiation of the photodynamic therapy, the benefits can extend far out into the future. Every case is different, but if in fact the latter process of tumor specific antibody formation takes place this is a lifelong recognition of the tumor cells. If the patient is fortunate enough to have the complete elimination of the tumor the benefit is obvious. Where there is significant reduction of tumor and the remaining problem has been dealt a significant blow from death of tumor cells, apoptosis and reduction in blood flow to the tumor there can be a favourable prolongation of quality life as well as increased longevity. Too, if the patient and physician feel, as a result of the treatment significant benefits were realized, the therapy can be repeated since no ‘resistance builds up’ to the treatment. Answer: The traditional therapies for cancer treatment usually begin with a diagnostic work up often leading to a confirmation by biopsy (obtaining a surgical specimen and subjecting it to microscopic pathological examination for the presence of cancer cells). If the tumor is solitary and in a non-critical area, the option of surgical removal (excision) is usually offered to the patient. In many instances, because it is sometimes difficult if not impossible to know fully whether the primary tumor has spread to regional lymph nodes and/or distant parts of the body, if the biopsy shows malignant cells the surgeon may also take samples of nodes and see if they show evidence of malignant cell spread. If this is the case, and in some cases even if this test is negative chemo and/or radiation therapy is recommended as ‘insurance’ against growth of these malignant growths that might or have spread. Some studies have shown the benefits of Chemo in general to be only about 2.5% in spite harsh side effects and the mutagenic nature of the chemotherapy agents (this is often not explained sufficiently in many authorities opinions.) A number of clinical studies have already shown light therapy to be as good as or better than the historical approaches (i.e. for head and neck cancer) and studies in recurrent breast cancer of the chest wall, where surgery, chemo and radiation have failed to keep the cancer from returning, light therapy has proven to be overwhelmingly effective in completely eliminating the cancer. Also, one of the great advantages with PDT is there is nothing that keeps light therapy from being used even after surgery, chemo and radiation. Substantial cost reductions are inherent in the PDT technology. However, the therapy may not be as effective if the previous therapy has significantly weakened the immune system. Consider the cost differences (financial, emotional/pain, personal) between a seven hour surgery for types of esophageal malignancies versus a 30 minute out patient PDT therapy. Answer: One experienced clinician in PDT states: ‘It can be applied before, or after, chemotherapy, ionizing radiation, or surgery, without compromising these treatments or being compromised itself.’ Many studies, however, have shown the presence of a strong and uncompromised immune system is a critical element for the full benefit of the PDT therapy and chemo therapy causes significant damage and lessening of the immune response. It follows that chemotherapy given before PDT will diminish the beneficial response from the agent and light. Also many studies had shown that a competent immune system in combination with PDT leads to the production of an ‘auto vaccination’ and tumor specific antibodies. If chemo is given soon after the therapy this process would also reduce the effectiveness of the overall favorable response. Fortunately, many patients have received significant favorable responses with PDT, in spite of having prior heavy chemotherapy etc. Answer: The usual side effect associated with ‘first Generation’ agents such as Photofrin, the one approved for use by the FDA in the US and the EMEA in the EU, has been prolonged photosensitivity or ‘sun-burn’. This is caused by residual agent remaining in skin and tissue for up to 90 days following intra-venous (by vein) administration. Foscan, the agent approved in the EU for treatment of head and neck cancer, likewise can lead to burning of the skin with sun exposure for up to a month or more. Fortunately, the agents used in the next generation of PDT clear quickly from the body’s skin and normal tissue and there is essentially no light sensitivity. Another symptom noted frequently is discomfort in the area of the tumor. This is not so much a ‘side’ effect as a ‘direct’ effect of the therapy resulting in tumor damage and/or death. The body attempts to eliminate the unwanted dead cells in the inflammatory process which is associated with discomfort, swelling, heat and redness. Answer: Because most photosensitizers are non toxic in therapeutic amounts, they are not recognized by the cells as a foreign material. In fact, they can almost be compared to ‘trojan horses’ since they enter the cell attached to a ‘carrier’ molecule called a lipo-protein in the same manner that sugars are transported into the cell also attached to lipo-proteins. To the cell they seem the same as sugar ‘candy’ entering for their enjoyment and nourishment. The cells ‘see’ no need to build a defense against this process so no ‘resistance’ develops in the cancer cells. The therapy (and agent) can therefore be repeated many times and no resistance ‘builds up’ to the process. Answer: Most photosensitizers are from a class of naturally occurring compounds named porphyrins or Tetrapyrroles which are among the most commonly occurring natural compounds in the world. For example, the chlorophylls are the primary photosynthetic pigments in higher plants, algae and bacteria. Other tetrapyrroles (porphyrins, chlorins and corrins) include cobalamin (vitamin B12) and heme/hemoglobin . Many natural porphyrins in the body are breakdown products from recycled hemoglobin and are intrinsically ‘light sensitive’. These accumulate in tumor naturally and cause cancer cells to ‘auto-fluorescence’. The first Generation photosensitizer approved for use in cancer treatment, Photofrin, is derived from pig or cow hemoglobin while some of the more advanced agents are either chlorophyll derivatives or chemically compounded. What is common to all these agents is the propensity to selectively accumulate on tumor cells and be energized by light. These are the vital elements that make the therapy so effective in the treatment of cancer and other diseases. Answer: There are a number of attributes which make a photosensitizer especially advantageous. Ideally an agent should massively accumulate in tumor cells with negligible amounts in normal tissue. Agents should ideally accumulate quickly in tumor but ‘clear’ quickly from normal tissue and skin. There should be a large margin of safety between the therapeutic dosage and any toxicity. Larger singlet oxygen yields from activation with light results in greater levels of damage to the cancer cells. Ideally if the treatment of deep structures is necessary, the photosensitizer should be energized by light that penetrates deeply into the body (red and infra-red). Photosensitizers need to travel through the blood stream (water soluble) yet need to be slightly lipophilic (fat soluble) to easily pass through the lipid cell membrane into the cell interior. Answer: "First Generation" drugs have several serious drawbacks. They are not very specific to cancer cells and tend to accumulate in skin and normal tissues as well. This means that not just cancer but normal organs also can be damaged by the light in the course of light treatment. In addition, they do not clear rapidly from the human body. Thus, when patients receive a first generation agent such as Photofrin®, they must stay out of the sun for up to a month or more, or else severe sunburn will result. Larger and deep-seated tumors generally cannot be treated with this agent without painful placement of light fibers placed via needles inserted into the tumor.. Finally, because of the lack of sensitivity, conventional PDT generally has to be delivered through endoscopic instruments inserted into cavities in the human body. This is an invasive procedure -- not as invasive as surgery, to be sure, but still unpleasant and potentially associated with infrequent but everpresent dangerous side effect. It also limits the number of sites that can be treated. The innovative approach of recent advances in PDT addresses these limitations and concerns. First of all, the newer photosensitizing agents used are technically superior to Photofrin and even to so-called "second Generation" experimental agents in development around the world. Many others sensitizers are red-pigmented and are derived from blood or do not clear quickly from the body and have patients have extended periods of light sensitivity. However, the next generation of PS is derived from the chlorophyll found in green plants. This yields a much more sensitive, effective and less toxic product. The first generation agents are injected intravenously but newer agents can given by mouth or even inhaled and have greater patient acceptance. Newer agents generally clear from normal tissues after 12 to 24 hours. Thus, after a day or so, patients can usually go about their business and are not held captive in their homes for weeks and months, fearing terrible skin reactions. Answer: Investigation and development of photosensitizers is occurring worldwide. Some of the names of approved photosensitizers are Photofrin, Visudyne, Foscan, Metvix, Alasens, Photogem, Photosens, Photosoft etc. Answer: Because many photosensitizers are derivatives of naturally occurring hemoglobin or chlorophyll the toxicity usually is low and the margin of safety between the therapeutic dosage and toxic levels us great. Many agents however, have a long residual period in the skin and normal tissue and long periods of sunlight photosensitivity are typical of first Generation agents: in the case of Photofrin 6-8 weeks is not unusual. Also with Photofrin selectivity for cancer cells is not very great so light applied to the area of tumor also results in swelling of adjacent normal tissue. Earlier agents such as Foscan are not naturally soluble in blood and there have been reports of damage to veins at the site of injection as well as prolonged sunlight photosensitivity. Additionally, Foscan is so light sensitive much care has to be taken to ‘shield’ adjacent normal tissue from light exposure. Answer: Typically, earlier photosensitizers have been given in an intravenous form but the Next Generation of PDT has pioneered the use of PS in an oral and inhalation form. This is possible since the agent is amphiphilic; (dissolves easily into the bloodstream while entering easily through the lipid cell membrane). The oral administration has obvious advantages in ease of administration, cost reductions from avoiding the need for IV set up and greater patient acceptance. Answer: Each photosensitizer (light sensitive) agent has a certain color in the visible spectrum (or specific wave-length in the NIR) of light at which they are massively energized. The technical term for this is ‘peaks of absorption’. The agents can be most powerfully activated (and therefore generate the greatest yields of ‘cancer killing’ singlet oxygen) by illuminating the treatment area with colors and wave lengths of light which match these peaks. The light source used in PDT has historically been LASER light delivered through fiberoptic bundles via an endoscope (tubes inserted into the lungs or esophagus to visualize areas suspected of harbouring cancer). The laser light could then be used to activate the agent collected on the tumor, leading to reduction or elimination of the tumor. This treats the localized area of cancer but does not address the possible small bits of tumor (metastases) that often spread from the primary into regional lymph nodes or distant sites. Additionally, laser light could be used with direct illumination of the tumor in the case of skin cancer or visible external tumors. To treat larger areas or the whole body the Next Generation PDT technology utilizes a device (Whole Body Light Delivery System) with tens of thousands of Light Emitting Diodes (LEDs) . These hi-tech light sources can be selected for the particular wave-length that specifically activates the photosensitizer. One additional advantage of using this light form is the possibility of using a mixture of LEDs (red and infra-red) to simultaneously activate multiple peaks of activation of the photosensitizer. Answer: Light is a form of energy that is familiar to us. However, the part of light that is visible to us is only about 10% of this spectrum of energy. The full range extends from ultra-violet (invisible), through all the colors of visible light into infra-red (invisible). Ultra-violet light has a very short wave length (370-390nanometers), is highly energetic yet only penetrated a small distance into the skin (because this wave length is greatly absorbed by hemoglobin). This is why UV light causes ‘sun burns’ on the skin but does not result in damage to deeper tissues or organs. In contrast, infra-red light (700-1300 nanometers) penetrates deeply into tissue, up to 25 cm. (12 inches) but does not possess very significant energy compared to uv light. Beyond this range water absorbs significant energy and limits the penetration of energy at the middle and far IR wavelengths. The band between 650-1300nm is called the optical or therapeutic window and the next generation of photosensitizer which have been specifically developed to optimize effective treatment of tumor and medical condition promises to revolutionize the safe and effective treatment of deep, advanced and metastatic cancer and other medical problems. These factors determine what colors (wave lengths) are utilized to treat the various areas of the body. Blue light, only penetrates a short distance into the skin and photosensitizers with peaks of absorption in the blue range are used for the treatment of skin lesions (skin cancer, warts, psoriasis etc.) because a powerful yet superficial therapy can be delivered. Red light, which penetrates much deeper into the tissue, and photosensitizers with peaks of absorption in the 630-690nm range (red) are used to treat intermediate to deep tumors. Infra-red light, which has deep penetration into the tissue, and agents with peaks of absorption in the infra-red range (700-1300) are appropriate for the therapy of deep tumors. Photosoft has peaks of absorption in the blue, red and infra-red so LED arrays are chose to contain both red and infra-red light sources. Consequently, agent that has accumulated on tumor even in the deepest part of the body is activated by the deeply penetrating near infra-red light sources. Answer: The ideal light source for the activation of PS Agents would be safe, convenient, portable, affordable, reliable and capable of delivering light of the correct wavelength(s) to the target tissue. In the past, the cost, complexity and availability of such lights has been a major impediment to the wide-spread availability of PDT/NEXT GENRERATION PDT but fortunately progressive improvements and new technology have to a great extent overcome these problems. Early photodynamic therapy used a ‘yellow dye laser’ (1987). This Laser cost more than €500,000 in today’s currency, had to have the toxic liquid changed on a regular basis and was very temperamental but was used despite the high cost and poor reliability. Later, investigators use filtered lamps (common slide projectors) to surface treatment applications. Today, affordable, reliable and compact ‘solid state’ diode laser have more than adequate power for the majority of applications. More importantly, the development of arrays of ‘light-emitting-diodes’ (LED’s) has been a breakthrough in providing light of sufficient intensity and appropriate wavelength for an increasingly wide variety of therapy applications, including the treatment of the whole body. The main advantage of Laser light is the narrow wave-length produced to precisely match the ‘activation peak’ for absorption by the PS Agent in use. Most all laser sources can be connected to small-diameter fiberoptic bundles which allow the light to be delivered to internal structures with the use of endoscopic equipment such as the lung, bladder, stomach, gall bladder and esophagus. However, the precision of the laser light emission can also be a limitation. Research has shown photosensitizers peaks of light absorption can shift once they enter the body so actually a wider range of wavelength (typical of LEDs) can actually lead to a more effective therapy. LEDs, Light Emitting Diodes, are ideal as light sources for advanced forms of PDT because they produce a bright, fairly precise color band of light and can be grouped to illuminate a large area. Another advantage is the possibility of combining several colors (wave lengths) in an array so multiple peaks of absorption of the agent can be activated. Too, infra red LEDs can be mixed in the panel for the treatment of deep tumor. Answer: A laser is a very precise and intense source of a specific color of light. They are generally quite expensive and delicate instruments costing as much as $100,000-$500,000 and require special eye protection for the patient and physician. LEDs by comparison are increasing in intensity while their cost is diminishing and do not require the eye precautions of lasers. Fortunately, in many studies the efficacy of the therapy using LEDs versus LASER is similar so the future seems to favor the use of LEDs. Answer: Lasers have unique advantages at present for light directed through flexible fiberoptic glass or plastic bundles that allow the light therapy to be directed via diagnostic devices that visualize internal structures (bladder, lung, esophagus, stomach etc.) and treat areas of suspected cancer. These light fibers can also be inserted into the lumen of large bore needles which have been inserted under ultrasound guidance into the center of a tumor. This method is called ‘interstitial’ PDT and is used especially with Foscan for the treatment of head and neck tumors with great success. LEDs are advantageous for the treatment of the whole body since large numbers can be grouped in panels. Also, LEDs with different wave lengths (red and infra red) can be blended in a panel so multiple peaks of absorption for an agent can be activated with one treatment session. Too, LED’s have a somewhat broader range of emission and shifts in peaks of absorption can still be activated. As with the interstitial method of treatment Life Science used LEDs and fiberoptic bundles to direct light to the center of tumors with considerable success as in the case of Liver Cancer. This method and PS are presently in FDA trials. Answer: A study from Germany and a FDA clinical trial undertaken by Life Science Oncology in the US suggests the potential efficacy of photodynamic therapy (PDT) in the treatment of liver metastases. Results of the German study were presented at the annual meeting of the Radiological Society of North America in December 2002. A research team led by Kerstin Engelmann, MD, of Johann Wolfgang Goethe University in Frankfurt-am-Main, treated five patients using a photosensitizing drug called SQN 400. This agent, manufactured by Scotia QuantaNova (SQN), is activated by infrared light at a wavelength of 740 nanometers. SQN 400 is the trade name of a chemical called meta-tetra (hydroxyphenyl) bacteriochlorin (mTHPBC), which is a chemically modified form of chlorophyll, or chlorin. All patients in the study had colorectal cancers that had spread to the liver, and all had been treated previously with chemotherapy. One had also received radiation therapy, and another had undergone the surgical removal of half his liver. Laser light was delivered through a catheter five days after the injection of the photosensitizer. Dr. Engelmann reported complete destruction of the cancer in three of five patients at follow-up examinations done three months after treatment. There were some serious side effects with SQN 400. Patients had to avoid bright electrical light for several days and direct sunlight for four weeks following treatment, due to the drug's photosensitizing effect and its slow elimination from the body. Three of the five patients reported local pain during injection. One reported that pain then spread to the shoulder. Several patients experienced minor burns. There are some significant differences between PDT using SQN 400 and some of the other advanced photosensitizers. These are absorbed and eliminated more quickly, and therefore have fewer side effects and less discomfort. Also, the source of lighting in Next Generation PDT is whole-body red and infrared light that is administered externally, not through fiber optic catheters, making for a noninvasive procedure. Despite the differences, this study does show that the combination of light at high wavelengths and green chlorin-based photosensitizers is a promising cancer treatment. In the authors' words, "This pilot study establishes that the procedure can eliminate metastatic liver tumors in some patients." But as they properly point out, more study is needed to see how useful the treatment is when compared with other ways of eliminating liver tumors. Answers: Many physicians are already aware of PDT as it has become an established cancer treatment over the past ten years. However, they may be unaware of rapid advances in PDT technology, because of the rapid developments in the field of photodynamic therapy. It is in the patient’s best interest when everyone concerned is thoroughly informed. Physicians may find out about older forms of PDT as well as the many significant developments in PDT by reading The PDT Book, investigating links to scientific studies/medical trials and through accessing published articles in the professional journals under the topic of PDT. Who is appropriate? Who would not be appropriate? Answer: Because advanced forms of PDT are relatively new treatments and the side-effects and after-effects are still not completely understood, certain individuals should definitely NOT attempt to receive it. who are suffering from severe cachexia, i.e., the wasting syndrome. whose tumors involve the spinal column (where removal of the tumor could lead to collapse of the vertebrae). with a history of vascular or clotting problems. with the disease known as porphyria (a light-sensitizing condition). who are clinically depressed (and are unlikely to follow through with treatment). As this therapy suppresses the immune system and NGPDT activates it, ideally a patient should allow a period of at least one month after last chemotherapy or until the immune system is strong enough before beginning NGPDT . Surgical procedures / a question of timing! As a result of surgery the growth of neo-vasculature tissue commonly occurs as part of the healing process. Since PDT agents selectively collect in new vessels and cause coagulation of these vessels this is effect is beneficial in reducing the blood supply to cancer tumors but if insufficient time (at least one month) has not lapsed since the last surgery this effect in the area of recent surgery would not be desirable. Following NGPDT the immune system is activated, so ideally patients should not have medicines which reduce this enhancement of the immune system. There is some evidence antibiotics diminish the immune response so antibiotics are not advised unless absolutely indicated. Vitamin C and all high dose anti-oxidant medications and herbs containing such high dose anti-oxidants should be avoided during the period of NGPDT therapy. As these drugs are specifically designed to counteract the immune system response we recommend they be avoided altogether, at least during the course of NGPDT. women who are pregnant or who intend to become pregnant within one year of completing treatment. Next Generation PDT is not for everyone. If a patient has significant volumes of tumor they can experience a period of intense malaise associated with the inflammatory reaction and elimination of large amounts of dead tissue. The inevitable breakdown of tumor presents a major challenge to the body. The extent of this challenge obviously is proportionate to the tumor load of each individual but for most patients it is present to greater or lesser degrees." Symptoms may include: Flu-like syndrome, tiredness, night sweats and chills, inflammation and discomfort in areas of tumor breakdown. Patients with extensive liver or peritoneal spread of tumor may show signs of abdominal tenderness, or pain. Patients with metastases in the lungs may experience productive coughing. These symptoms can be present for anywhere from two to six months or more depending on tumor load. It is sometimes difficult for people to be patient with this process but it is, after all, the essential desired effect and reason for doing the therapy in the first place. With improved treatment protocols and more gentle light therapy we observe these symptoms are becoming less troublesome. However, experience has shown certain individuals are not appropriate for this treatment. The list of general contra-indications is shown above. The Valkion Air Singlet oxygen energy device has been documented to increase oxygen utilization and increase the chemical ATP in the body (this is the Chi energy molecule in the body). The Valkion Air device has been in use for over a decade with worldwide enthusiasm. Ozone therapy before NG PDT may also be used to increase the oxygen available to the patient. Answer: There are four principle effects of the therapy that begin shortly following the administration of the agent and the application of the appropriate light. If enough light energy has reached the agent on the tumor there can be outright death of cancer cells. The body attempts to remove these dead cells through the process of inflammation. Sometimes the cells are damaged and they are rendered incapable of functioning properly and multiplying; they eventually die in a process named apoptosis. Because the agent also accumulates on the blood vessels, following the application of light the blood can coagulate and the flow diminish or cease. Additionally, with fragmentation of the cells the body can react by forming antibodies to the tumor. How this translates into what a patient experience depends on many variables. If the amount of tumor is small and not is a critical area there can often be few if any symptoms. Other factors such as; 1. large tumors spread to lungs, 2. liver and/or brain, a compromised immune defence from previous chemotherapy and 3. a debilitated condition challenge dealing with significant breakdown of tumor can be a considerable challenge for the patient. Symptoms of pain or discomfort in the area of tumor necrosis, weakness, tiredness etc. can also be present. Answer: For solitary superficial tumors such as skin cancer the complete response rate can approach 98%. Since the area can be observed easily, if there is no sign of recurrence, no further treatment would be necessary. However with increasingly serious cancers, especially those which have spread to lymph nodes and/or metastasized (spread to distant areas of the body) the usual diagnostic tests (MRI’s, Cat scans, ultrasouond, PET scans, tumor markers, biopsy etc.) are usually use to monitor progress and fortunately the therapy can be repeated if benefits are realized from the initial therapy. Answer: While the benefits of cancer destruction or damage (apoptosis), stasis, coagulation of vessels feeding the tumor and the potential production of tumor specific antibodies (auto vaccination) begin soon or immediately after the initiation of the photodynamic therapy; the benefits can extend far out into the future. Every case is different, but if the latter process of tumor specific antibody formation takes place, this is a lifelong recognition of the tumor cells. If a patient wishes to enroll in the NGPDT treatment program, they will need to provide accurate and up-to-date medical, laboratory and imaging scans so a realistic assessment of their medical condition and suitability for treatment can be determined. The patient may be asked for additional tests to be completed at the hospital before a final assessment is made of suitability for treatment. Flights: Fly directly to Guangzhou (Canton) Or Fly to Hong Kong (HK) and transfer by connecting flight, train or bus to Guangzhou(GZ), China. Note, when taking the train from HK to GZ, go to Hung Hom Kowloon station from here you can take the direct train to Guangzhou East station. NOTE: If you decide to take the NGPDT treatment please email us your itinerary once you have confirmed your booking details. If you require additional information or have further question kindly contact us at the above numbers or email address. Answer: If the therapy is provided in a jurisdiction where the medical authorities have approved the agent for the specific medical indication, insurance or government payment is usually covered. However, because this is a recently introduced therapy in many areas the costs of the treatment are considerable and unfortunately due to cost considerations some governments limit the availability of PDT. In the UK, PDT using Visudyne®, a potentially sight saving procedure in cases of the leaky type of age related macular degeneration, is restricted to patients only if they have already lost the sight in the ‘other’ eye. Hopefully, as clinical studies increasingly substantiate the benefits of this therapy, insurance coverage will be universally applied, since in many cases the therapy may represent a significant cost savings over conventional surgery, chemo and radiation with their well know debilitating side effects. Question: Why isn"t this therapy more available? Answer: Medicine is by it very nature a conservative enterprise. The motto: ‘above all else do not harm’ is ever present in the consciousness of most physician. Any new therapy or medication must for ethical, moral and legal grounds be proven to be the least toxic and most effective possible option for a particular treatment. As this principle applies to the traditional therapies for cancer it is difficult for advanced forms of Photodynamic therapy not to compare favourably, in the light of the severity of the side effects of the present therapies on offer. One of the problems with the adoption of this new therapy is that it may to a great extent replace the current therapies. The highly trained and skilled cancer surgeon, oncologist and radiation therapists could potentially be made redundant and obsolete with the significant technical medical advances presently under investigation. This group represents a powerful and influential group who control entry into the medical system, sit on the consultant committees of the FDA, insurance companies and advise on the payment (or non payment) of ‘new’ therapies. They have a possible conflict of interest if they are asked to give advice or decide on approvals for technologies which might put themselves out of business or at the very least allow a powerfully competitive technology enter the medical environment. These factors and others may play a part in the ongoing availability to patients desirous of availing of this therapy. Answer: It was as early as 1903 when the first report appeared, from Munich, relating the use of a light-activated chemical for the treatment of a patient with skin cancer. In that account Professor von Tappeiner and Dr Jesionik described the application of a red dye called eosin to the area of disease, which was followed by exposure to sunlight or white light from an arc lamp. Although some positive results were noted there were no systematic clinical studies until the 1970’s, when collaborative work between scientists and clinicians at the Roswell Park Institute in the US introduced methods that heralded the modern era of photodynamic therapy (PDT). Over the past 35+ years extensive clinical and laboratory work has been directed towards developing these methods, in order to maximize the effectiveness of therapy for a variety of conditions - including various types of skin cancer and other dermatological disorders Much of the early PDT work, both in skin and with other tumors, employed a photosensitiser based upon the biologically important porphyrin molecule (the name derived from the Greek word porphuros, meaning reddish purple). In fact a compound called hematoporphyrin (Hp) was first recognized to induce generalized photosensitivity in 1913 when Meyer-Betz, a bold German researcher, injected himself with this substance and subsequently developed pain and swelling in areas exposed to sunlight. He remained photosensitive for more than 2 months. It was not until 1937 that Hp was demonstrated to have a potential dermatological benefit, when it was used in a small number of psoriasis patients. In the decades that followed it was recognized that Hp was a poorly-defined mixture of different porphyrin species, which led to the search for the most active fraction, which when chemically separated was termed hematoporphyrin derivative (HpD). This was first introduced into a human clinical trial for the treatment of a variety of skin tumors in 1978. As investigations progressed this drug underwent further stages of refinement, ultimately resulting in the established PDT agent that is now marketed as Photofrin (Axcan Pharma Inc, Canada). A Way to Kill Cancer Cells? In the early 1970s the success of PUVA impressed Thomas J. Dougherty of the Roswell Park Cancer Institute in Buffalo, N.Y., leading him to wonder if a variant of it could be effective against cancer. Activated psoralens can kill rogue cells to settle inflammation, but in comparison with porphyrins they are not potent photosensitizers. If psoralens could kill individual cells, could porphyrins perhaps devour whole tumors? His idea was the beginning of true photodynamic therapy, in which photosensitizers catalyze the production of oxygen free radicals. It was built on earlier work, which revealed two medically useful properties of the porphyrins: they accumulate selectively in cancer cells and are activated by red light, which penetrates more deeply into biological tissues than do shorter wavelengths, such as blue light or UVA. Dougherty injected a mixture of porphyrins into the bloodstream of mice with mammary tumors. He then waited a couple days for the porphyrins to build up in the tumors before shining red light on them. His early setup was primitive and passed the light from an old slide projector through a 35mm slide colored red. His results were nonetheless spectacular. The light activated the porphyrins within the tumor, which transferred their energy to oxygen in cells to damage the surrounding tissues. In almost every case, the tumors blackened and died after the light treatment. There were no signs of recurrence. Dougherty and his colleagues published their data in 1975 in the Journal of the National Cancer Institute, with the brave title "Photoradiation Therapy II: Cure of Animal Tumors with Hematoporphyrin and Light." Over the next few years they refined their technique by using a low-power laser to focus red light onto the tumors. They went on to treat more than 100 patients in this way, including people with cancers of the breast, lung, prostate and skin. Their outcomes were gratifying, with a "complete or partial response" in 111 of 113 tumors. Sadly, though, cancer is not so easily beaten. As more physicians started trying their hand with PDT, some serious drawbacks began to emerge. The affinity of porphyrins for tumors turned out to be a bit of an illusion--porphyrins are taken up by any rapidly proliferating tissue, including the skin, leading to photosensitivity. Although Dougherty's original patients were no doubt careful to avoid the sun, nearly 40 percent of them reported burns and skin rashes in the weeks after PDT. Potency was another issue. The early porphyrin preparations were mixtures, and they were seldom strong enough to kill the entire tumor. Some porphyrins are not efficient at passing energy to oxygen; others are activated only by light that cannot penetrate more than a few millimeters into the tumor. Some biological pigments normally present in tissues, such as hemoglobin and melanin, also absorb light and in doing so can prevent a porphyrin from being activated. Even the porphyrin itself can cause this problem if it accumulates to such high levels that it absorbs all the light in the superficial layers of the tumor, thus preventing penetration into the deeper layers. Many of these difficulties could not be resolved without the help of specialists from other disciplines. Chemists were needed to create new, synthetic porphyrins, ones that had greater selectivity for tumors and greater potency and that would be activated by wavelengths of light able to reach farther into tissues and tumors. (For each porphyrin, light activation and absorption occur only at particular wavelengths, so the trick is to design a porphyrin that has its absorption maximum at a wavelength that penetrates into biological tissues.) Physicists were needed to design sources that could produce light of particular wavelengths to activate the new porphyrins or that could be attached to fine endoscopes and catheters or even implanted in tissues. Pharmacologists were needed to devise ways of reducing the time that porphyrins spent circulating in the bloodstream, thereby restricting photosensitive side effects. Finally, clinicians were needed to design trials that could prove an effect and determine the best treatment regimens. Answer: The use of PDT has been limited in the past to the treatment of localized areas due to the limited availability of advanced photosensitizers and light treatment devices. Although some Physicians may have heard of the therapy many doctors not associated with treating cancer and even oncologists have little in depth knowledge or understanding of the fundamentals and principles involved in this therapy. Also until recently there have been few articles in the general press dealing with the therapy so it is understandable that the general public has heard little to nothing about Next Generation PD/PDT. Fortunately, news travels fast in the age of the internet and with an increase in the availability of the therapy and advances in photosensitizers and light delivery systems we feel many people investigating advantageous cancer therapies will include PDT as a preferred treatment option. We hope this comprehensive source of information will further the general knowledgy of the technology and increase the consciousness of the benefits and advances in PD/PDT. Answer: The internet and ‘search’ engines have made information of a highly technical or medical nature accessible to all people, not just professionals. It is possible for a concerned individual to research a topic such as this therapy and be more informed on the fundamentals and technical details of light therapy than the vast majority of physicians. It is not uncommon for a physician to have several patients arrive each day for consultation armed with a thick stack of downloaded pages from the internet and a vast and detailed knowledge of their specific diagnosis. The days of Doctor as ‘God’ and all knowing with a foreign sounding technical vocabulary know only to an elite few is past. Many Doctors lead busy professional lives with work schedules that leave little time for ‘keeping up’ with the latest developments and the many advances in Medicine. As more information and corroboration of the favorable benefits of light therapy appear in the professional literature as well as the lay press there will naturally follow an increasing knowledge and acceptance of the therapy. In the meantime the list of scientific articles that accompany this booklet and appearing on the website www.pdtbook.com will give added evidence and ‘proof’ of the effectiveness of this promising therapy. Answer: One potential application of an effective yet non-toxic therapy would be for prophylaxis or prevention of cancer at a ‘pre-clinical’ stage before it becomes manifest in the individual. Agents selectively attach to small nests of tumor and with the application of ‘whole body’ light; the result may well be the elimination or reduction of tumor. It will take additional time and clinical studies to explore fully the possibilities in this area but the implications of having a non toxic form of whole body treatment for incipient cancer is profound. Answer: There is a long list of medical conditions that respond favorably to this therapy and many more possible uses that are suggested by laboratory studies. These are: Cancer, Eye disease, vascular disease, rheumatoid arthritis, psoriasis and many skin diseases, acne, bacterial, viral and fungal diseases and many others. Answer: Age-related Macular Degeneration (ARMD) (wet type). The so called ‘wet type’ (neovascular form) of age-related macular degeneration (AMD) is the leading cause of blindness in elderly people in the developed countries. The cause of neovascularization is not well known, but what is observed is the ‘new vessels’ invading in the space and layers of the retina and the ‘leaking’ of these abnormal vessels as demonstrated by fluorescein angiography. If this affects the critical area of vision in the retina (maculae) where the photoreceptors for most of the color and central vision are located the decrease in vision can be devastating. This process can lead to irreversible loss of central vision and blindness after only a few month or years. Answer: Otto Warburg won the Noble Prize in 1931 for documenting the basic metabolism of cancer cells differs from normal cells. Cancer cells have a ‘Lactic Acid’, anaerobic (no oxygen) metabolism with highly negatively charged micro structures (mitochondria) while normal cells are characterized by Aerobic (oxygen) metabolism. Because photosensitizers tend to precipitate in an acid environment (such a cancer cells) and have elements on the molecule that are positively charged they adhere to the negative charges on the structures in the cancer cells. Likewise, because viruses are made of RNA (ribonucleic acid) and gram positive bacteria have a cell wall with a large proportion of an ester of lactic acit, the same accumulation of agent on viruses and gram positive bacteria takes place. The aspect of photodynamic therapy which affects vasculature and blood stasis is exploited in the use of the therapy for improvement of AMD. Due to a selective uptake in areas of choroidal neovasculature of certain photosensitizers, (Visudyne™ is the approved FDA agent of choice at the present time) light can be applied which leads to the selective thrombosis (closure) of the leaking vessels and the interruption of progressive damage to the maculae and consequent decrease in vision. PDT is now an established therapy for the treatment of ‘wet’ neo vascular Age Related Macular Degeneration (AMD) and some other retinal diseases associated with leaky new vessels. The reason for this possible decrease is red blood cell disruption (of cell membrane) caused by light irradiation during NGPDT. The following values may rise within days of NGPDT and may take many months to recover.